OLD PARKED CARS. : 1968 Oldsmobile Vista Cruiser. 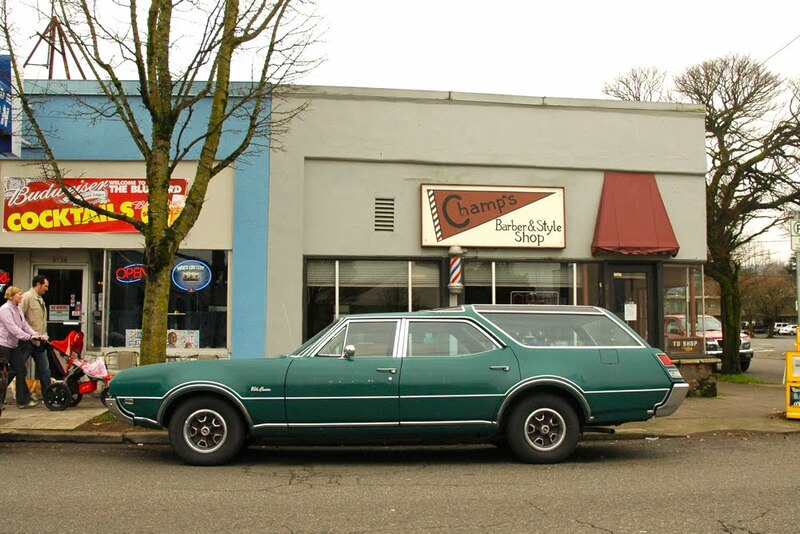 Take such a beautiful original Vista Cruiser and let those assholes at Chip Foose RUIN it? Hell no. 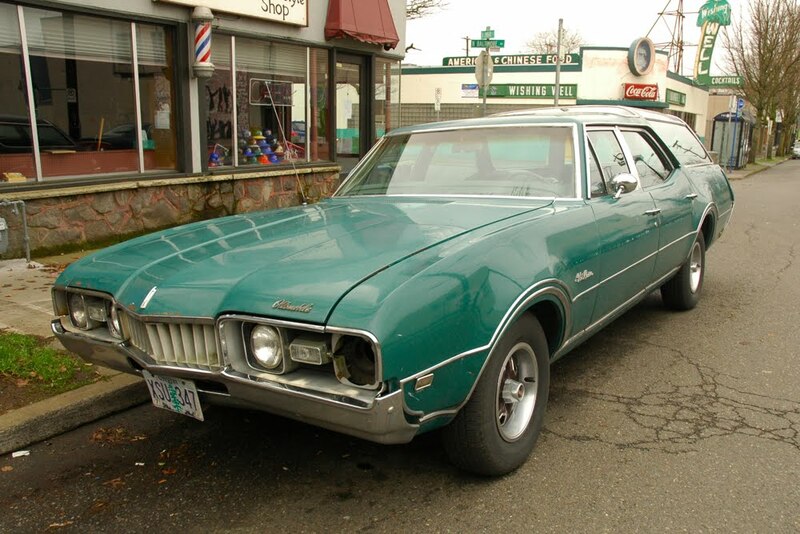 it's surprising to think that oldsmobile was once a player in the muscle car game. i would've loved riding in the third row as a kid, looking out the skylights. and as a parent, i'd love to have a v8 to shove all those kids and groceries. 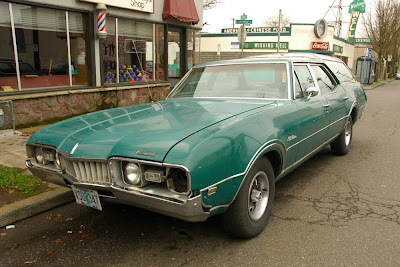 "...oldsmobile was once a player in the muscle car game..."
From wiki: "Oldsmobile introduced the 88 badge in 1949. 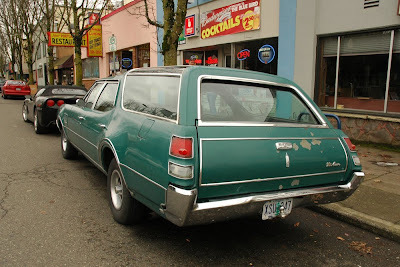 It was named to complement the already-existing 76 and 98, and took the place of the Oldsmobile Straight-8 engined 78 in the model lineup. 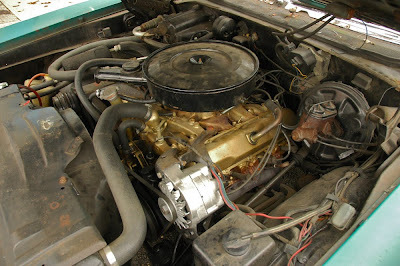 The new car used the same new Futuramic B-body platform as the Oldsmobile Straight-6 engined 76 but paired it with the powerful new Rocket V8 engine. This combination of a relatively small light body and large, powerful engine made it a precursor to the muscle car. The Rocket 88 vaulted Oldsmobile from a somewhat staid, conservative car to a performer that became the one to beat on the NASCAR (National Association for Stock Car Auto Racing) circuits. It won six of the nine NASCAR late-model division races in 1949, 10 of 19 in 1950, 20 of 41 in 1952..."
"Rocket 88" (originally written as Rocket "88") is a rhythm and blues song that was first recorded at Sam Phillips' recording studio in Memphis, Tennessee, on 3 March or 5 March 1951 (accounts differ). The recording was credited to Jackie Brenston and his Delta Cats, who were actually Ike Turner's Kings of Rhythm. It has been claimed by Phillips and some music critics to be the "first rock and roll song".